St Michael's Church, AlnwickSt Michael's Church, Alnwick | Living out the Christian faith and life in the heart of Northumberland. St Michael’s is an open and inclusive church sharing the good news of Jesus Christ and serving the local community. With origins in Saxon times, and handsomely rebuilt in the 14th and 15th centuries, St Michael’s Church is steeped in history. It is also one of the architectural gems of Northumberland. Join us at one of our regular Worship Services: we have several services every Sunday, and during the week on Wednesdays. Details of special services such as Saints’ Days can be viewed on our What’s On page, as well as other upcoming events which we warmly invite you to attend. Many couples choose to get married at St Michael’s, and many choose to have their child baptised (Christened) with us. Further information about marriages and baptisms can be found on our Weddings and Baptisms page. 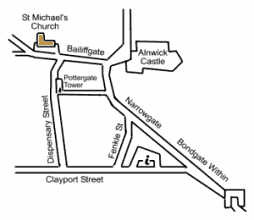 A map showing how to find the church is at the bottom of this page, along with a virtual tour of St Michael’s, and if you have any queries, please feel free to use our Contact page where you will find our postal address, telephone number, and email address. If you would like to book our Parish Hall, then please contact Flori Icatoiu or Paul Tutleman on 0742 427 2903 or email bookstmichael@gmail.com. A series of photos of interesting, important or just plain fun things that have happened at St Michael’s. All photos are also available on our Flickr page. Mini Michaels is our group for toddlers and babies (and their parents) which meets every Thursday in termtime, usually in church. For more information (including a timetable of activities in a typical session, please see our Children page). Our slideshow below shows some of the things they have been up to lately. Click here for a Google map with directions to the church and Parish Hall. The Vicar of St Michael’s Church is the Rev’d Canon Paul Scott. Click here for his blog. Information about accessibility at St Michael’s.